December 2008 brought the sudden tragic loss of our special family member, Keel Spirit, RID (Holy Cross, RID X Keel Dobbin, RID by Irish Leader.) Spirit suffered a lethal case of enteritis. Our vet worked tirelessly in earnest to try and alleviate her distress. She willed life until the end, passing with us by her side. This magnificent mare has produced a purebred mare, a purebred stallion prospect and a sport horse filly. Our vet said that in all his years of practice, he has rarely seen such a stoic horse. I told him that this is the Spirit of the Irish Draught. Keel Spirit, RID was imported from Ireland as a 4 year old. Spirit is a rare black mare by Holycross, RID who was sired by Ben Purple, RID known as the all time greatest producer of outstanding Irish Draught broodmares. Holycross, RID has followed the tradition proving himself as an influencial sire of top quality Irish Draught broodmares. Spirit is the spitting image of her sire and shares his presence. 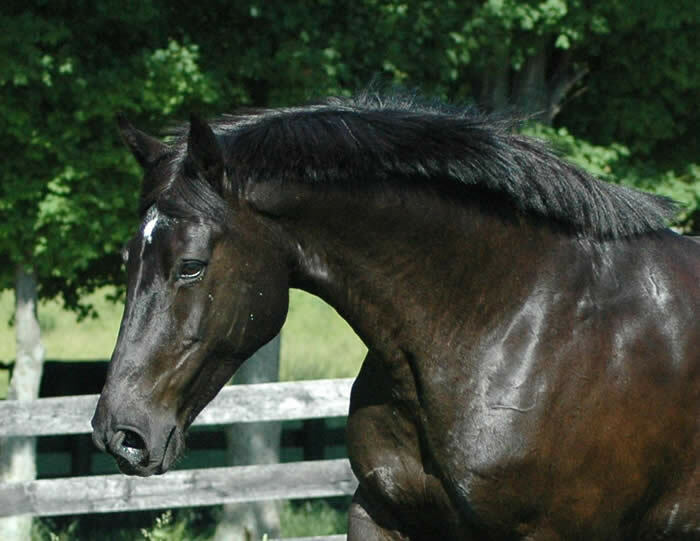 A mare with presence is said to be the best producer of stallion sons. She is out of Keel Dobbin, RID by Irish Leader, RID, an exceedingly rare bloodline making Spirit a key contributer to genetic diversity within the world-wide Irish Draught herd. Spirit is the overall picture of harmony and grace. Like her sire, Spirit is built uphill. Her elegant neck originates high from her chest and withers. She has a particularly lovely head and narrow throatlatch, an asset for the purebred Irish Draught. She has a perfect length of rein flowing into a strong wither and back to powerful haunches. This proud mare has a wonderful saddle position and deep hearthgirth, highly desirable and indicative of great stamina. Her amply broad chest sits squarely upon correct limbs with generous good flat bone. Spirit is an especially forward moving mare. At the grand age of 18, she shows no sign of arthriits and moves with rhythmic speed. Her well articulated joints contribute to agility, grace and surefootedness. We have great expectations that Spirit will produce World Class Purebred Irish Draught performance prospects that are true to breed type. She has produced the promising purebred ID stallion prospect, Oceallaigh's Proud Celtic Knight, ID by Huntingfield Proud Tim, RID. The Irish Draught Breed is on the Endangered Breeds list and is precariously close to losing genetic diversity. Without earnest preservation efforts, the threatened gene pool will prove catastrophic for the purebred Irish Draught. At the turn of the century, a small band of concerned Irish Draught breeders in Ireland convened to discuss strategies for the preservation of foundation stock for the coveted Irish Draught Sport Horse. In 1978 the North Ireland Irish Draught Society was formed. Other regional groups also initiated efforts dedicated toward preservation of diverse Irish Draught bloodlines. Members of the Irish Draught Horse Society of Great Britain, the United States, Canada and Australia followed suit. In 2006, the international Irish Draught Horse Conservancy was launched. BenMar Farm is committed to the preservation of genetic diversity within our worldwide purebred RID herd. The pedigree of our impressive imported RID mare, Keel Spirit, may contain some of the rarest of the rare bloodlines and is thus, a great asset to the Irish Draught population. Spirit is a total outcross in both sire and dam lines. Out of Keel Dobbin, by Irish Leader, her dam line is so obscure, little is known. Our research has only begin. We wil add updates periodically as to our progress. Due to Spirit's age and temendous genetic value, true breed type and rare color, she will be put to purebred Irish Draught stallions for the remainder of her breeding career. Stallion prospect homes for all colts will be sought to help ensure genetic diversity within our global herd. Fillies will be available to homes that will include breeding at some point in their careers. Spirit will be bred to our stallion, Bridon Belfrey, RID for a 2009 foal. Please inquire early as her foals tend to sell at birth. The black coat color is considered rare with only 1/10th of 1% currently expressed in the Irish Draught population. 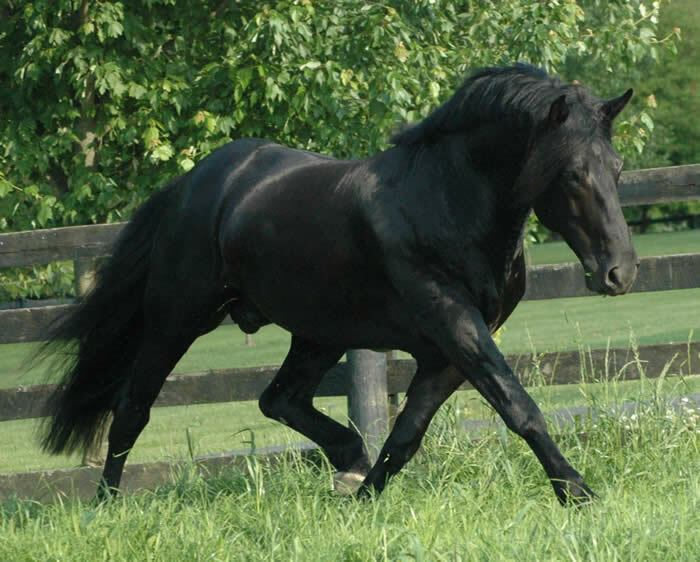 In a predominantly grey breed with many individuals being homozygous (producers of only grey offspring), the black pigment adds further ID genetic diversity. DNA color testing of Keel Spirit, RID specifies she has a 25% chance of producing a homozygous black foal (producer of only black offspring) when bred to a heterozygous black RID stallion (producer of black and other colors). The birth of a purebred homozygous black foal would be historic since there are no homozygous black Irish Draughts in the world to date. The offspring between Spirit and Belfrey can produce heterozygous blacks, chestnuts, bays, and homozygous blacks.